Bulgarian-French-Bulgarian Dict (Win) is a dictionary especially designed for mobile phones. It is helpful when it comes either to translate Bulgarian language to French or the opposite way. Bulgarian-French-Bulgarian Dict (Win) consists of a large vocabulary database which contains thousands of words in both two languages. It also offers a selection of the most frequently used words in French and in Bulgarian. This program provides clear definitions of each word. It also gives detailed information about the use, the context and the pronunciation of the most commonly words. They are presented in MSDict electronic format. Bulgarian-French-Bulgarian Dict (Win) includes a powerful search engine so as to make it faster to search for a word meaning and translation. It quickly finds the specific word and displays its various definitions and context of use in Bulgarian or French. The dictionary database can be installed on a memory card and on the phone's memory. 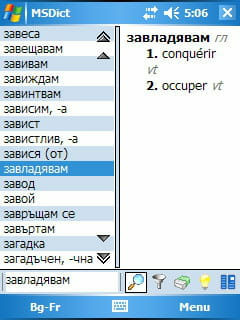 Bulgarian-French-Bulgarian Dict (Win) offers a specific button allowing quick erase. This version presented here is a 30 days trial. Latest update on October 6, 2014 at 04:45 AM.